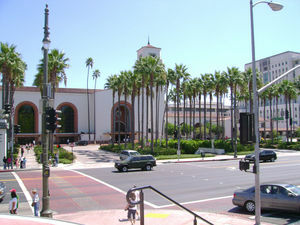 Los Angeles Union Station is the major transit hub in all of Southern California. It is served by rail and bus lines in the Los Angeles region and beyond. 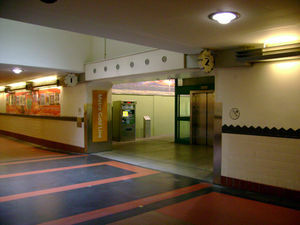 This station has two main portals and concourses: the west portal at historic building by Alameda Street and east portal at Patsaouras Transit Plaza by Vignes Street. 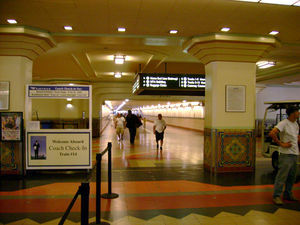 Union Station is the main hub for Metrolink. It is served by every line ( ) except the Inland Empire-Orange Line. Ticket machines and 10-ride ticket validators are available at the east and west station concourse outside of the pedestrian tunnel. Purchase or validate ticket before boarding. Metrolink trains generally use Track 3 through 9, which is accessible through the main pedestrian tunnel. Each platform has A (north end) and B (south end) boarding areas. Overhead electronic displays in the tunnel show the upcoming train departures at each exit to the platform. A big screen in the waiting room/seating area shows the upcoming train departures and boarding locations. Union Station is a major Amtrak hub in the West Coast. It is served by Pacific Surfliner, Coast Starlight, Sunset Limited, Southwest Chief trains and Amtrak Thruway buses. Ticket counter and baggage checking service for long distance trains are available at the west concourse. Amtrak trains generally use Track 10 through 12, which is accessible through the main pedestrian tunnel. Amtrak Thruway buses stop on the north side of the station. There's a separate check in counter for long distance train riders. Metro Rail lines serve Union Station. Red Line and Purple Line stop at the underground platforms located below Metrolink and Amtrak tracks. Red and Purple lines have a separate entrance from the main building and the Gateway Plaza on the east side of the station. 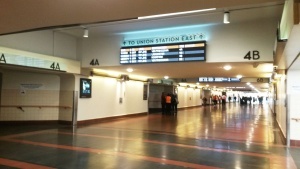 Transferring passengers from the Gold Line, Metrolink, and Amtrak need to exit through the pedestrian tunnel to either the east or west side of the station to access Red/Purple lines. Ticket machines are available at the Red/Purple Line station concourse. First time riders must purchase a reusable TAP card with a fare from the machine before boarding. All riders must pass through the turnstile with a valid TAP card or TAP-enabled ticket/transfer and keep the card or ticket for the duration of the ride. Both lines share a center platform at the station. 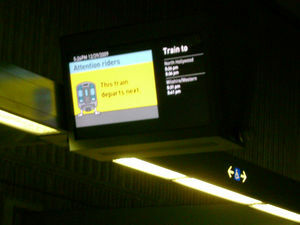 Overhead LCD displays show which train departs next. Gold Line trains to Pasadena and East Los Angeles stop on Track 1 and 2 (accessible through the main pedestrian tunnel). Ticket machines are available at the platform entrance. First time riders must purchase a reusable TAP card with a fare from the machine before boarding. All riders must "tap" the TAP card or TAP-enabled ticket/transfer at a validator when entering platforms and keep the card or ticket for the duration of the ride. LAUS is served by many bus routes. Buses stop at various locations at or near the station. Paid daily and hourly parking is available at west and east side of the stations. Fees for all day parking range from $6 snd $10. This page was last edited on 12 December 2018, at 16:15.